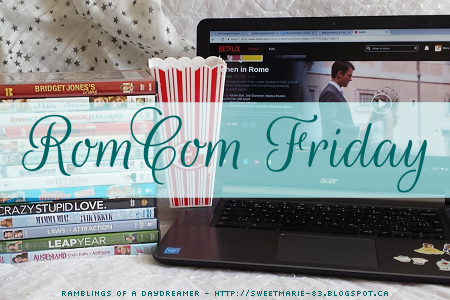 RomCom Friday is a brand new feature here at Ramblings of a Daydreamer. I’ve always been a romantic comedy addict, and since I’m currently writing a romcom, I thought it would be fun to feature a favourite romantic comedy every week and talk about why I love it. Please note, there will be spoilers for each movie. Most people I know either love or hate Adam Sandler. Are his movies ridiculous and sometimes downright stupid? Sure. Does his humour often verge on crude? Absolutely. Are all of his movies gold? Heh. No. But he does have some gems, and The Wedding Singer, in my opinion, is one of them. I also love Blended, Just Go With It, and 50 First Dates, but today I want to focus on my first and ultimate favourite movie of his, and that’s The Wedding Singer. While there are elements of the ridiculous in this movie, I find it completely charming, hilarious, sweet, and swoony. In my last RomCom Friday, I talked about how I love Julia Roberts and Richard Gere together in Runaway Bride and Pretty Woman, and would love to see them in more movies together. The same goes for Adam Sandler and Drew Barrymore - there’s just something about these two together. Plus, just like with Garry Marshall’s movies, you know that with Sandler’s movies you’re going to see a lot of familiar faces, and there’s something oddly comforting about that. Going back to what I was saying about Adam Sandler earlier, he often plays characters who are almost caricatures, but Robbie Hart is a normal guy. He wants to be loved, be in a stable relationship, and write and sing music. He’s content with his life until his fiancee leaves him at the altar because he’s ‘just a wedding singer’ and doesn’t have bigger ambitions. Drew’s character, Julia Sullivan, likes Robbie just as he is, and doesn’t think he needs to change if he’s happy doing what he’s doing. I love their interactions and how they play off each other, plus the rest of the cast is great, too. Robbie and Julia are easy to connect with and feel for, which is one of the reasons I love this movie so much and have seen it more times than I can count in the last 19 years. Romantic comedies are pretty formulaic and predictable, but movies like this make me fall in love with romcoms all over again. The Wedding Singer has so much heart, and since Robbie and Julia both have this innocence about them, it makes for a sweet, feel-good story. For being a funny, kind of silly movie, it also has a surprising amount of depth, particularly in its messages about love and romance. And can we talk about the amazing 80s soundtrack, and countless nods to 80s culture, including a fantastic cameo from Billy Idol? Yeah, I seriously love this movie. Do you like The Wedding Singer? Which camp do you fall into regarding Adam Sandler: love, hate, or indifferent? Do you agree that he and Drew Barrymore make great movies together? I love this one. I learned the other day that my husband hasn't seen it. Looks like I'll be watching it again soon.